Iced coffee is one of the most refreshing drinks that you can have when the weather starts to heat up. This is especially true if you live somewhere where it starts getting hot even before the sun comes up and want to start the day with iced coffee instead of hot coffee. I will make a big pot of coffee, chill it and pour it into ice cube trays to make ice cubes that won’t water down my iced coffee. 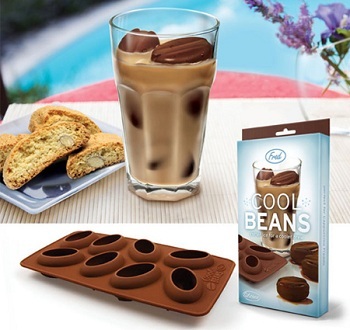 You can do this with any type of ice cube tray, but the Cool Beans Coffee Bean Ice Cube Tray makes ice cubes shaped like coffee beans that will compliment your iced coffee in looks and flavor. The tray is silicone and, while firm, bends easily so you can pop the formed beans out. Whether you use this type of tray or not, fill up a big ziploc bag with a few batches of coffee ice cubes and get ready to enjoy plenty icy cold coffee drinks in the summer.